This was a major top of the table contest. 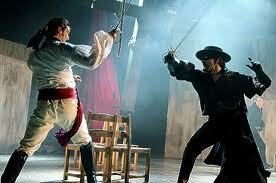 A duel fit, on paper, to grace any Hollywood blockbuster. The finest swordsman of London clashing with their counterparts from Sheffield. As it turned out, our one sword was more than a match for the two cutlasses in their crest. A sword however is a minor weapon in your artillery when you have Johnnie Jackson and his (now famed)deadly free kick. Last week up at Hillsborough the skipper produced a sublime free kick worthy, many said, of deciding a Premier League game. Working to that basis, yesterday's was worthy of winning an international, and one of some importance as well! A crowd of nearly 21,000, only beaten outside the Premier League by Cardiff, Leeds, and West Ham, packed into The Valley to see the top two battle it out in this much anticipated encounter. Most would agree Sheffield United have been the best side to come to SE7 this season. Others have come and taken a point, the Blades however played good creative football yet took nothing home due to a lack of finishing. It took twenty minutes for Charlton to break the deadlock. Another wondrous strike from the captain into the top corner was powerful as well as accurate, a better free kick you will not see. Sheffield United did have a chance themselves with a free kick a little later but a stretching Hamer turned it around the post at ground level. Yann Kermorgant nearly made it two with an acrobatic overhead kick but the ball went over the bar. I'm always impressed with the athleticism required to do that. Even twenty years ago i could not physically attempt that kind of manoeuvre, getting my foot waist height was an achievement. Before the interval the ball did end up in the Charlton net. Hamer seemed to get the ball from the United corner and palm it into the net whilst falling in the process. There was a yellow shirt behind him and I'm guessing he had a tug at our keeper. I'll have to watch it again to be sure though. Danny Green had a couple of chances in the second half but fired them both at the opposing keeper. Up the other end, the Blades had a few chances themselves as Hamer struggled more than once with balls being crossed into his box. Deadlier finishing would have seen the visitors get some reward for their efforts. Green made way for Darel Russell with a quarter of an hour to go. Russell could not have guessed what an impact he would have on the game. A strong challenge, the type the game was full of in the golden days of football, in which he won the ball was adjudged by the referee to warrant a straight red. This is a referee who came into the game with a reputation for being 'card happy'. What followed was plenty of push and shove from both sides, Yann Kermorgant had a good handful of yellow shirt before being mugged by Blades substitute James Beattie. Bettie got the Frenchman around the neck and proceeded to try and strangle the forward. You don't need me to tell you that you can't do that on a football field, another straight red and it was ten versus ten for the remainder. Charlton hung on though and as many people tweeted, it was Johnnie Jackson 2 Sheffield 0. Two weeks ago most would have bitten your hand off for four points from these games, some happy with two. I'll be honest, not in my wildest dreams did i think we'd get all six. Six it is however and Charlton now sit proudly on top, seven points clear and with a game in hand. I need to book a trip to Cyprus to visit my mum this spring. I think i can safely book it for the week the play offs are happening now. It's possible, just possible, that the twitter hashtag may just happen, #championscomemay. "I need to book a trip to Cyprus to visit my mum this spring. I think i can safely book it for the week the play offs are happening now." I really wish you hadn't said that! Still too early? Strange experience as a Charlton fan, but I'm full of belief! The revolving door never stops.